Motorhome sales are buoyant and we’re insuring lots of new motorcaravanners here at Caravan Guard. 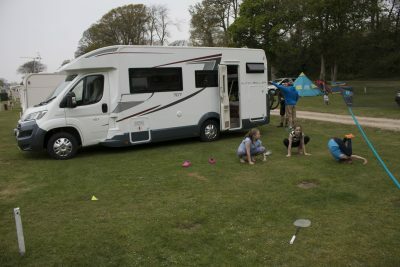 So what better way to find out more about the fun and freedom of motorcaravanning – by sending one of our newest employees and her family on their first motorhome trip. 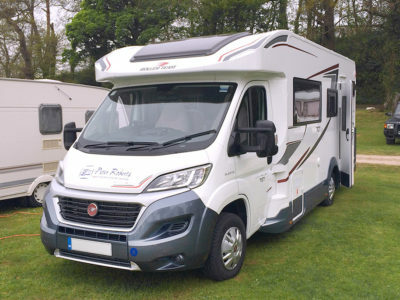 They chose to hire a 2016 Autoroller 707 Lo Line six berth motorhome from Yorkshire-based Peter Roberts Motorhomes and headed off to North Wales for a weekend of adventures. 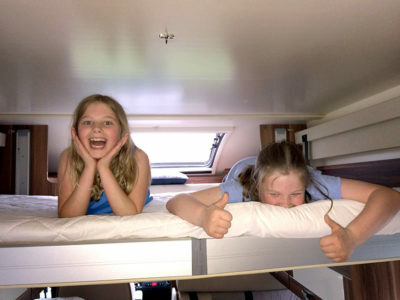 Here’s what the Harrisons thought of their first motorhome trip…. After weeks of worrying about what to take, would it all fit in, would the ‘van be overweight, would it be hard to drive, would the kids like it, would we know how to work everything, we were off! We booked our pitch at Coed Helen campsite in Caernarfon, and downloaded Caravan Guard’s motorhome pre-journey checklist. Plus we looked at lots of hits and tips on the Caravan Guard blog and other websites to check we knew what we were doing. As regular tent campers we had some ideas about what we might need to take but were reassured by Peter Roberts that all we needed was bedding, clothing and food – oh and our bikes! Plus their comprehensive one hour (plus) handover gave us plenty of information about the workings of the motorhome to make sure our first trip was bump and hassle-free. 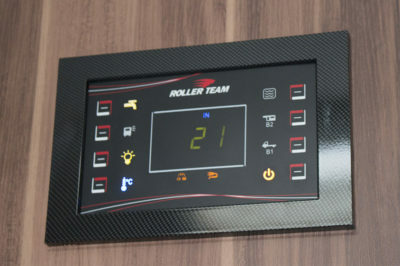 We wrote some of the important stuff down – like connecting the electric hook-up to the van before the electric hook up point on site, and what the different symbols on the water and heating system panel meant. We were a bit nervous about driving such a large vehicle and would we remember how to work all the gas and electrics, and when to empty the waste! But it was all surprisingly easy. Huge mirrors on the motorhome and a colour reversing camera made driving a breeze, and we were surprised how smooth the ride was. The girls also enjoyed being able to read and play cards whilst travelling and found it all very comfortable and “fluffy”! The only downside was the noise of the metal racks and cutlery rattling in the habitation area – just a minor irritation and easily blocked out with a pair of headphones or by turning up the DAB radio! The ‘van’s Fiat Ducato 130bhp engine had plenty of power, plus an in-built Sat Nav and lots of space in the cab for refreshments, paperwork , etc. There was room to stretch your legs and it was all quite relaxing – with the only thing to worry about being the inevitable traffic jams! The compulsory wee stop (for the kids) was needed before we reached our destination but there was no need to wait for the next service station, or listen to constant cries of are we there yet! We simply pulled into the nearest available lay-by and the girls could visit the on-board loo and we were back on our way – simple! Even the narrow lane down to Coed Helen wasn’t a problem for the motorhome – we knew our height and width limits – and driving onto our pitch in the early evening was trouble-free. Within minutes we were also hooked up, level and cooking on gas! 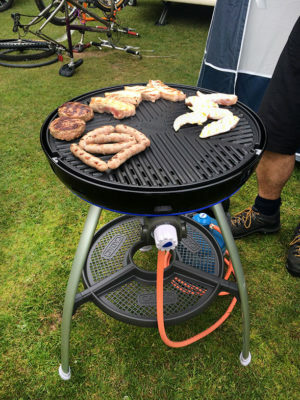 The girls immediately wanted to explore on their bikes, so they were quickly unhitched from the motorhome’s bike rack (for four) and they were off exploring whilst we cranked up the barbecue and started to familiarise ourselves with the cooking facilities. 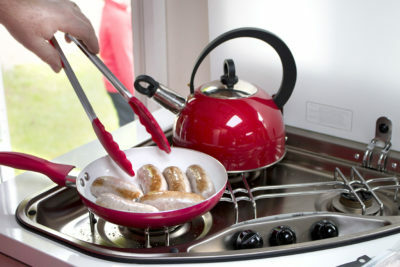 Oh and not forgetting to get the kettle on and crack open a bottle of wine – it all helps! 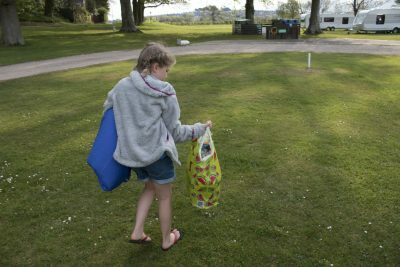 We’d packed enough food to see us through the weekend and had a rough plan of what we intended to cook and how, to make sure we made use of both the indoor cooking facilities as well as enjoying a barbecue – after all it’s a must when camping! There wasn’t much space for food preparation in the L-shaped kitchen but there was a large table to use, and having a huge fridge to hand was a real luxury for us. 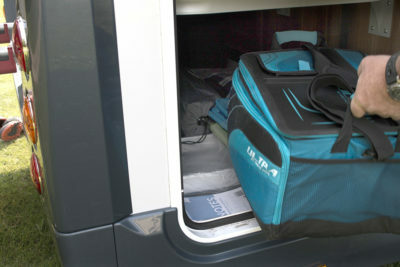 With its 140L capacity there was plenty of storage – and much better than the coolbag we’re used to taking in the tent. The pull out salad box made sure everything was well chilled – including the wine – and the freezer was big enough for ice cubes and a few extras! Our bags, outdoor chairs and games, were easily unloaded from the double-entry garage and there was plenty of storage for clothes, food items and the girls nick nacks. Our youngest particularly like the little shelves for her teddies and books around the bunks. After the barbecue, an explore of the campsite and a few songs on the guitar from the eldest, it was time to think about settling down. We were all looking forward to a proper bed rather than an air bed and the kids were particularly excited about being in bunks with their little safety nets attached! We had the luxury of an electric bed, which the girls loved to automatically retract down from the ‘van roof for us. It really was extremely comfy, with lots of headroom, complete with storage shelf for my glasses and a small drink. But nearly forgetting to put up the privacy covers on the windscreen and pull the blinds down over the windows before getting ready for bed – could’ve been a bit embarrassing for us and our neighbours! It was also great not to have to walk across to the shower block to clean our teeth, wash our faces and pay a call before retiring for the night. Plus, the array of ambient lighting in the motorhome was also a real luxury and the girls were very happy with their little bedside reading lamps – making it like a real home from home! We were up bright and early the next morning to the pitter patter of rainfall. We were relieved to be dry and warm in the motorhome rather than under canvas – and that we didn’t have to dash to the toilet block in the rain! A traditional English breakfast was the order of the day and was quickly cooked up on the motorhome hob and grill and was eaten inside around the table – all very civilised! 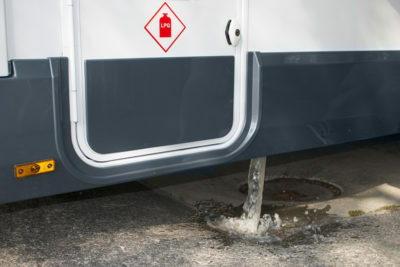 After a day, the motorhome display was flashing at us to alert us to fill up the water tank and the toilet cassette was ready for emptying not long after. It was all very easy to resolve and is a minor sacrifice for having running water and bathroom and kitchen facilities literally on tap! After a day out exploring the delightful streets of Caernarfon and then a ride around the shores of the Menai Strait and into the countryside on our bikes, we were back at the motorhome, cooking up a pasta Bolognese with garlic bread, using the hob and cooker. The pans provided were a little smaller than we were used to and not really ideal for a family of four or six, but we managed by cooking in batches. There was a shower in the motorhome but as a family of four, we didn’t fancy having to empty the grey waste water every night so we used the onsite facilities for showering. We only had to top up the water twice to accommodate teeth brushing, hand washing, toilet trips and washing the pots. 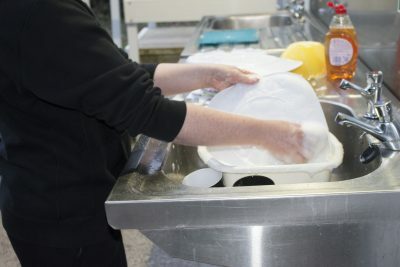 The dirty pans were cleaned at the site’s pot washing area. The bathroom was spacious though, again with plenty of storage and hangers for towels, all complete with no banging of elbows! 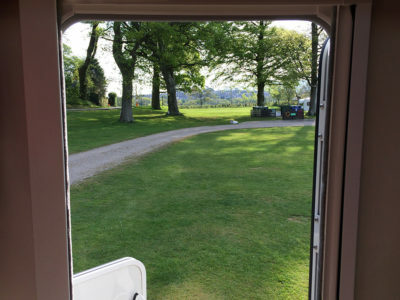 When it came to leaving, we got out our trusty Caravan Guard motorhome checklist and ticked everything off – from emptying all the waste and turning off the gas, to checking the tyres and mirrors and closing all the windows and skylights. Everyone was buckled up and off we headed back to Yorkshire – knowing that there would be some rattling along the way this time! 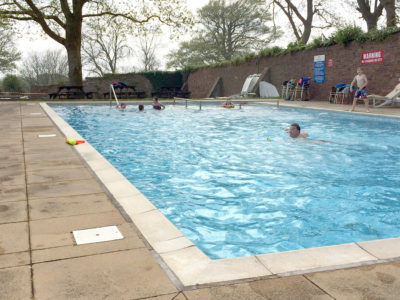 We had to take the motorhome back to Peter Roberts with a full tank – and we were surprised how economical it had been for our short break, costing just £50 for a rough 300 mile round trip. The family Landrover Discovery would’ve guzzled more juice! So, it’s fair to say we all loved our first motorhome trip. The main benefits being the comfort and constant and easy access to a loo, hob and fridge. Plus the luxury of a proper bed and heating when or should you want it. It took a bit of getting used to the layout and space – you quickly learn how to walk like a crab as you shuffle past each other! The weather was pretty kind to us so we got plenty of chance to enjoy the freedom of the outdoors – but also a rainy evening to test the internal space when having to retreat indoors for supper – oh and to put the on-board telly on for an hour of Sunday night entertainment before bed. 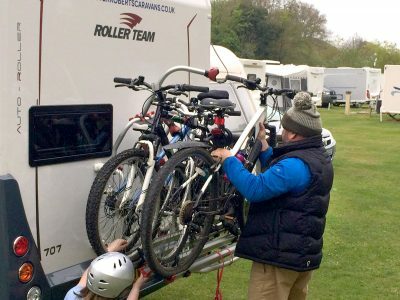 We loved being able to throw open the motorhome door in a morning, choose whether to dine al fresco or “in-house”, then jump on our bikes and enjoy the Great British outdoors. The idea of being able to set off for a few days, a week, or even two; with one, two, three or more stop-offs along the way, certainly appeals. And even taking a home on wheels across the waters to the Continent could be next on our bucket list. We all really warmed to the motorhome and the eldest described it as a cross between staying in a hotel room and camping in a tent. Overall we had a fantastic introduction to motorcaravanning, with special thanks to Peter Roberts motorhome hire for the use of such a well-equipped and modern ‘van. 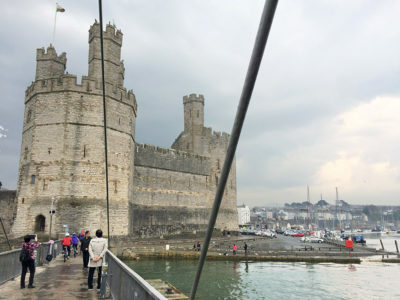 We packed a lot into three days, managing to barbecue, cook on the hob, bike along the coastline, eat out at a local pub, walk into Caernarfon, have the obligatory ice cream, go for a swim on site, play games, knit, plus lots more besides. The kids absolutely loved it and joined in with the little jobs of filling up the water, taking the rubbish out and checking the windows were closed when we went out for the day. 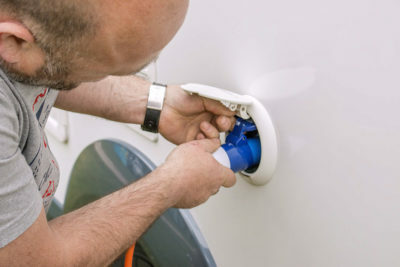 Nothing was too much trouble living and travelling in the motorhome and if we were to do it again we wouldn’t change a thing – oh apart from remembering to shut the garage locker door when you’ve removed all your belongings and take it back to the hirer!! So, it met all our needs and some – for our next adventure we might even be ready to try a bit of wild camping! You can see some of videos of the family’s first motorhome trip on Caravan Guard’s You Tube channel – including a special motorhome song from one of the girls! And to find out more about our motorhome insurance cover and range of discounts click here. Can you remember your first motorhome trip or are you about to venture out in your ‘van for the first time? We’d love to hear your stories in the comments box below. A very interesting and positive article which should assuage the fears of first time motorhomers whether hiring or purchasing. Reference to the checklists available through the Caravanguard website a good pointer too for a hassle free first adventure.